The Spring edition of the NJPN newsletter is now available to download. 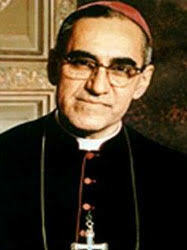 The lead article reports on the canonisation of Archbishop Oscar Romero, patron saint of NJPN. Feedback from the National Poverty Consultation in Manchester, includes a report from campaigner Stef Benstead who shared his thoughts on Christian responses to poverty. The speaking personally column features Ellen Teague, a member of the JPIC team of the Columban Missionary Society in Britain, who writes and campaigns on Justice, Peace and Ecology issues.